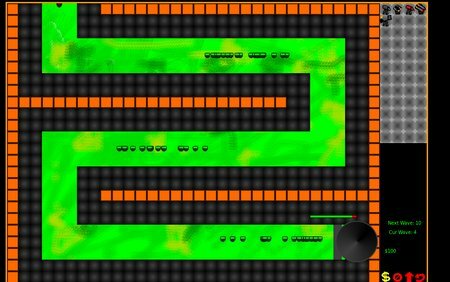 I entered Ludum Dare 27 which is a 48 hour competition to make a game – the reward is the game that you make. The theme was “10 Seconds” and there were many creative approaches to the theme – mine wasn’t that creative but was something I had been wanting to do for a long time – A Tower Defence game. The theme was incorporated in that every new way starts 10 seconds after the previous one. Once again (as per LD25) I didn’t have as much time as I would have liked and so the result is not terribly polished – however I did get a game with a reasonably good balance (I think) between hard and easy. It also lacks any kind of sound – which I am hoping to fix in the future. The competition version of the game can be found here. The code can be found and forked at https://github.com/filtoid/ld27. I am hoping to get working on a Post Compo version at some point – I need to address a few usability issues and add sound etc. And hopefully some more towers.